MacGregor, part of Cargotec, has secured its third identical offshore crane contract for Volstad Maritime AS series of 125m offshore construction vessels being built by Bergen Group Fosen shipyard in Norway. The order is booked in the first quarter 2013 order intake. Two more active heave-compensated (AHC) MacGregor offshore cranes have been ordered for hull 091, the third in a run of 125m-long offshore construction vessels (OCVs) for Volstad Maritime AS. 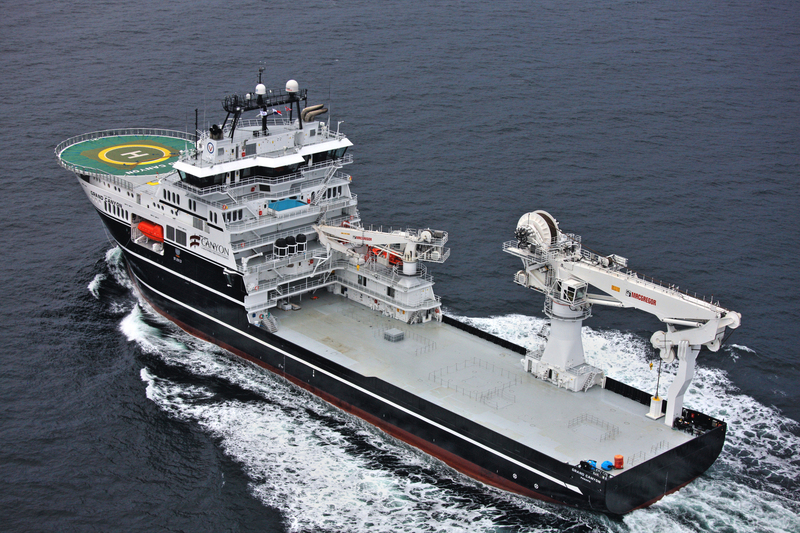 The vessel is part of a series of Skipsteknisk ST-259-CD design sisterships being delivered by Bergen Group Fosen shipyard in Norway for the seismic exploration and offshore inspection, repair and maintenance specialist. As with the two previous orders from Bergen Group Fosen, the OCV will feature a 250-tonne subsea crane and a 15-tonne offshore crane. The delivery is scheduled for August 2014. "This is the third identical offshore crane order we have received for these versatile, specialist vessels," says Frode Grøvan, Director, Sales and Marketing for Advanced Load Handling. "The OCVs will perform a range of subsea maintenance and construction work, and, like the cranes, have been designed for operation in harsh offshore environments." The first of Volstad's new-generation fleet, Grand Canyon (hull 089), was delivered in October 2012. Hull 090 was ordered in February 2012 for handover in October, 2014. MacGregor is part of Cargotec. Cargotec's sales totalled EUR 3.3 billion in 2012 and it employs approximately 10,500 people. Cargotec's class B shares are quoted on NASDAQ OMX Helsinki under symbol CGCBV.